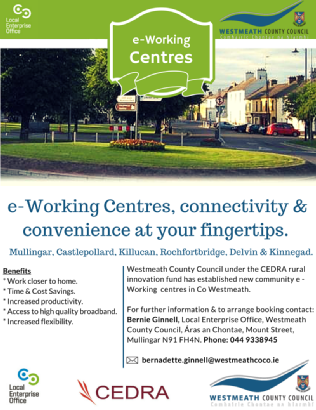 Westmeath County Council under the CEDRA Rural Innovation and Development fund has established six community e-Working centres across the county of Westmeath. The centres will be located in Mullingar, Castlepollard, Rochfortbridge, Delvin, Killucan, and Kinnegad. The towns were chosen to act as strategic hubs within the REDZ framework plan.